The term Rohingya is derived from the word Rohai or Roshangee, a terminology pervered to Rohingya. Rohai and Roshangee are terms denoting the Muslim people inhabiting in the old Arakan (Rohan/Roshang/ Roang). It is probably the corruption of Arabic term Raham (blessing) or Raham Borri meaning the land of God's blessings. The word Rahma to Rahmi-Rahmia-Rahingya to Rohingya, which denotes honest, dutiful, pitiful or kind hearted to others. Mon-Talaing army, the Rakhine Maghs used to call the Pathan as brave as tiger. They mixed with the Arab descendants for centuries and become Rohingyas. "Arakan, infect, a continuation of the Chittagong plain was neither purely a Burmese nor an Indian territory till the 18th century of the Christian era. Chiefly for its location, it was not only remained independent for the most part of history, but endeavoured to expand its territory in the surrounding tracts whenever opportunity came and Chittagong was the first to be the victim of the territorial ambition of the Arakanese monarchs. ...... Shut off from Burma by a hill range, it is located far away from the Indian capitals. The relation between Chittagong and Arakan is influenced by geographical, ethnological, cultural and historical considerations, from about 1580 A.D. nearly a century, Chittagong was under almost uninterrupted Arakanese rule which is undoubtedly an important period marked by momentous events. "There were Moors, Moghuls and Pathans also in Arakan.... Thus, the Muslim population of Arakan consisted roughly of four categories, namely, the Bangalee, other Indian, Afro-Asian and native. Among these four categories of Muslims the Bengali Muslims formed the largest part of the total Muslim population of Arakan." The Arabs and Pathans army are founded the original nucleus of the Rohingyas in Arakan, who arrived from Arab and Bengal Sultanate during the time of Arakanese kings. The Arabs were the first to lay the foundation of Muslim society in Arakan in the later part of the 7th century A.D. and the waves of immigration from Bengal were very significant, for with these immigrants came the Muslim nobels, statemen, traders, teachers, poets, and soldiers. There had been large-scale conversion of the Hindus, Buddhists and animists to Islam who also constitute part and parcel of the Rohingya. In 15th century the number of converts to Islam soared, specially as the Muslims has established standard of credibility and stature in the community, initially through inter-mirrages. These various migrations led to the admixture of blood and culture to form one common racial and linguistic classification to be known as Rohingya a term derived from "Rohang", the ancient name of Arakan. The Rohingya people developed a culture which was relatively advanced for that period. Schools, Madarasas were established, epics, ballads and riddles were advanced, music and dances were performed. This culture spread out all over Arakan. The Rohingya economy was also relatively developed. They developed agriculture, trade and commerce and extended their trade relation with neighbouring countries. Today the majority of the Rohingya people rely on agriculture as their base of subsistence; even Rohingya fishermen engage in agriculture during the non-fishing period. Among the Muslim population of Chittagong two distinct ethnic characters are found; one is known as Chatgaiya and the other Rohai. Although professing the same religion they have different cultural habits. In fact the Rohais of Chittagong today are those Muslim people who fled Arakan (Rohang) as a result of Bunnan atrocities after the country was occupied in 1784 A.D. As many as 50% of the total population of Chittagong district are Rohais who trace their ancestoral origin to Arakan. The Rohingyas trace their origin to Arabs, Moors, Turks, Persians, Moghuls, Patthans and Bangalees. Since Rohingyas are mixture many kinds of people, their check-bone is not so prominent and eyes are not so narrow like Rakhine Maghs and Burman. Generally they are broad shouldered, thin-bearded, a bit taller in stature than the Rakhine Maghs and Burmans but darker in complexion. They are some bronze coloured and not yellowish. 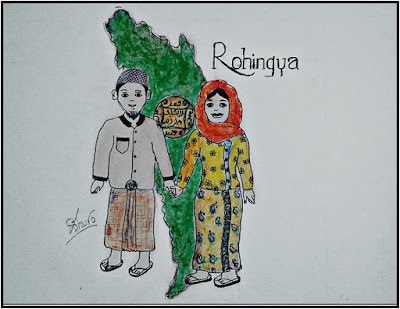 Aside from the compulsion of geography the Rohingya national identity is unique into Itself in terms of language and culture. The Rohingyas speak a common language and have common cultural trials. Almost all the Rohingyas are Muslims though there are a few Rohingya language speaking Hindus and Baruas. The Rohingyas are proud of their distinctive culture and language. They can not be classified cultural sub-group. The Rohingyas inhabit a contiguous area and therefore have a separate territory which is the most crucial element in a national identity. The Rohingya populations in North Arakan are united by ancient heritage, a rich culture and distinct language. They have lived for many centuries within well defined geographical boundaries which demarcate their "Traditional Homeland". The group identity of the Rohingya people has grown over the past several centuries, hand in hand with the growth of their homeland in North Arakan, where they worked together, spoke to each other, founded their families, educated their children and also sought refuge, from time to time, from physical attacks elsewhere in Arakan and Burma. The Rohingyas were once in absolute majority in the whole of Arakan. But they have been exterminated in a systematic and planned way and their homeland has now shrunk progressively in insignificance or to semi-preservations — a process still evidenced. Planned increase in the Buddhist population systematically exterpate the Rohingya people and destroy the crucial geo-graphical link between areas in the whole of Arakan. It threatens the Rohingya's claim to a contiguous homeland of the whole of North Arakan. The face of Rohingya homeland has been changed as the Rohingyas are helpless to check their demographic erosion. Despite systematic extermination of Rohingya population by means of genocidal actions and continued persecution, the Rohingyas still predominate in the area between the river Naf which demarcates the border between Burma and Bangladesh and river Kaladan, the longest river in Arakan. But the Rohingyas still claim that all those areas which have been inhabited by Muslims or atleast within their sphere of influnce before the pogram of 1942 are also included in their Traditional Homeland. Arakan has always been a country with two nations within one geographic entity. Two different peoples, from the very ancient period, have been inhabiting Arakan. During the course of their settlements Arakan is divided into two parts : Muslim North and Buddhist South. That is the Rohingya homeland of North Arakan and Rakhine homeland of South Arakan. Though Rohingyas live everywhere in Arakan and they are once majority in Maungdaw, Buthidaung, Rathidaung, Akyab, Kyauktaw, Mrohaung and Minbya. Now, they are majority only in former Mayu Dist. and Akyab Island. All Rohingyas profess Islam. They are strict followers of Islamic traditions. In every village there is atleast one mosque and one grave-yard. Rohingya Muslims celebrate religious festivals with great joy and enthussasm. Great rejoicings marked the two Eids, Eidul-Fitr, and Eidul-Azha (Qurbani Eid). Eids prayers were generally offered at Eidgahs or Mosques (where there is no Eidgah) and the days were spent in feeding, feasting and visiting the houses of the neighbours and relations. They also visit graveyard for ziyarat who left them earlier. Zakat is paid by all solvent Rohingya people ordinarily during the month of Ramadan. Qurbani is offered by all according to their financial means. Shab-i-Maraj, Shab-i-Barat and Shab-i-Qadar were observed with prayer, devotion, alms-giving and feeding of the poor. Romadan is greeted by all Rohingyas with much religious fervour. The birth day of Hazart Mohammed (s.m.) was celebrated every year on 12th of Rabiul-Awal as known Uman-Nabi. Though the Rohingyas lived together with Rakhine Maghs, they lived with their own culture.They never eat together. Inter-marriage also not so common. They live in separate villages. Every compact village or a part of it formed a social unit with the mosque as its centre and a uniting force for the convenience and regulation of social life of the inhabitants of the area. The eldest, pious, and influential man in the society was recogonised as the head of village society (Samaj) who decide all disputes among them with the help of village elders. In Arakan, Rohingya people live in somewhat densely packed villages and the majority of their houses are built of wooden pole, bamboo, thatched with palm-leaves (Dani) and stand on stilts as a protection against the floods that rise and surge under the monsoon rains. At townships headquarters and at most villages of any size or importance a few brick houses are to be found in Arakan. In the large villages have a fair number of wooden houses with thatch (dani) or corrugated iron roofs. The soil of Arakan is very fertile and the climate is ideal for rice cultivation. Arakan is dependent entirely on agriculture; all other occupations are subsidiary to, or exist for the maintenance of, the agricultural population. Of total Rohingya population 80% are occupied in agriculture or pasturing. The next order of numbers are those engaged in trade in food-stuffs. The third in respect of numbers are shop-keepers and followed by persons engaged in transport by water and by road, wood workers, fisherman, manufacturers of tobacco and salts. Endogamy is a factor resulting in the practice of segmentation. In other words, endogamy reinforces ties of common descent. The Rohingyas practise endogamy. In early days, a Rohingya would not be eligible for marriage until three voyages of trade by water or three trips of trade on land. Otherwise, he would be looked down by the society and would call him impotent with contempt. The Rohingya would never marry with other non-Muslim without conversion to Islam. If one many without conversion to Islam, the Rohingya society would boycott them until and unless he or she embraees Islam. So, the Rohingya parents control their children and arrange marriage between the parents. If they eloped, after having love affairs, the Rohingya society used to condemn them. Betrothal is arranged by the Rohingya parents. The bride and the groom are not allowed to meet before marriage. Family lines are thoroughly checked before the engagement. Engagement breaks if there arise dissension amoung the parents or guardians. Mohar is fixed by the parents or guardians of the bride and the groom and it is most essential according Islamic law. It must be given by the groom for the bride. Both the bride and groom must declare their willingness by pronouncing the words "Khawbul Ahsi" (we do agree) in front of at lest two witness and the molvi Shaheeb (Alim) who perform the mirrage. Divorce rate among the Rohingyas is less then other races of Burma. The wedding ceremonies are held in receptions as far as possible. The receiption diner is usually held by the family of the bride-groom. In special case called "Salami", the reciption dinner is hold at bride home. During the wedding month the relatives of the newly wedded couple use to invite them and are served with at least one meal in consecutive days by each and every household of their relatives which shows their affections for the couple. In almost all Rohingya's marriage ceremonies 'Howlla’ (Group singing) songs sing and folk-dancing of girls and women are common. Rice is the staple food grain of Arakan. The diet of the Rohingya is simple rice, fish, vegetables and chillis; meat was taken on occasions. The majority Rohingyas eat dry fishes with fresh vegetables or potatoes or also without any of them. On all festive occasion cows, water-buffolos and goats were slaughtered for sales and distribution. Rakhine Maghs like pork very much. Rohingyas never touch or eat pork. Pork is forbidden by Islam. They eat mutton, beef, chicken after making Halal according to Islamic teaching. Rohingyas honoured their special guests slaughtering a goat or more with their means and the poor with a chiken. The Rakhine Maghs males wear Gaung-Boung and Rohingyas males wear caps. The Rakhine Maghs wear Burmese jackets and Rohingyas wear coats. In olden days Rohingya used to wear Turbans of white clothes of 10 yards long and 1/2 yard breath. But British and Indian culture changed the dress of the Rohingya. The male Rohingya wears a shirt with long sleeves called Bazu covering the upper part of the body while the lower part is covered a sheet of cloth stitched from side to side called longgi. Vest or gonji is wear as inner garment by the Rohingya male. The adult female Rohingya wears long sleeved garment known as Suli to cover the upper part of the body while the lower part is covered with a Tami. Inner garment called Boduli long sleeve barazier wear every gril and woman of Rohingya. They wear a petticoat of cloth called Assar. This is without tie or fastening, but is broutht round the waist, with the edges well twisted in and kept on by the graceful curve of the hips. Young woman fastened a silk Belt called Rayshamer-Dowali and old women fastened a pice of red cloth 2.5 yards long and six inches wide stitched from side to side called Jali to hold their Tami on their waists. She also wears a scarf known-as Romal which cover the head and shoulders. Whenever she is out-door she wears a Burkha, traditional veil covering the whole body. Some Rohingya males keep hair fallen on shoulders. They are mostly Molvis. The Rohingyas, on their brith, they keep the Islamic names in Arabic. Some prefer Burmese names or Rakhine Magh names at schools mostly where the teachers are Rakhine Maghs as they can not pronounce Muslim name correctly. Some keep both names such as, Saleh Tun Sein, Ahmed Maung Maung and so on. It is also not good. Muslim should take pride as the kings of Arakan used Muslim titles. On the death of a Rohingya Muslim all the members of the society arranged his / her funeral as a social duty and hurried him/her in the graveyard with a prayer (janaza) according to Islamic Law. Rohingyas are good natured people. They are honest. They are not oppressors. They can not tolerate the oppressors. They defend their people even not caring their lives. They are brave and intelligent people. During the Second World War, the Rohingya fought for the Independence of Burma with courage. Though the Japanese easily conquered the Southern part of Arakan within a few days, the Japanese were unable to control the North-Arakan due to the defence strategy. Even the Japanese had to retreat failing to advance-through the defence operation of Rohingyas. The courage and bravery of Rohingyas should be recorded in Myanmar Razawin. As Rohingyas are always neglected people, their bravery was never recorded. Rohingyas respect laws and are peace loving people. Rohingyas have may indigenous sports and games which are usually held during summer and winter. Some also in rainny season. They are Boli-Khela (wrestling), Ghari-Khela (Boat racing), Mohal Khela, Gila-Khela Du Du Khela, Qunda Khela (weight lilting of round stone), Dan Khela, Ulu Khela, Ciyar Khela, Luk-palani Khela, Phoni Khela, Mal-pat Khela, Bak-goru Khela, Bosgya-buri Khela, Morish Khela, Bat Khela, Kalatur Khela, Saws-sa-rani Khela, Dope-marani Khela, diving and swimming, Paddy transplanting competition. The Rohingyas are fond of music (both vocal and instrumental) and dance. Rohingyas have their own folk songs, dances and musics. Howla songs sing by women in almost all Rohingya's marriage ceremonies and also women dance their flok dences in the same ceremonies. Young women mostly used mouth orgen (Baza) while dancing.Bitayali Geet, Jari Geet and Gazir Geet are very music is very sweet and meladious. Those who had came across the Rohingya National Programme from the Burma Broadcasting Service (BBS), they may recall the art of the Rohingya music. There is separate Rohingya language, literature and civilization. It developed through Islamic civilization. Rohingya language is a mixture of Arabic, Persian, Urdu, Bangali and Rakhine Maghs, because they are the people of border and as same as the people of other border of Burma. In the year 1429 A.D. General Wall Khan introduced Persian as state language of Arakan and also introduced Qazi courts in Arakan. Rohingya language is not recent make up. Muslim writers and poets used to write in this language since the early days in Arabic and Persian alphabets. One of the book is still in the possession of the author (Tahir Ba Tha). In addition to this, the coins of Arakan were melted in Arabic and Persian and also there are numerous Kyauksa (stone inscriptions) carved in Arabic. The Rohingya literature is considerly rich in ballads, love songs, Floktales, Baramasa, legends,mystic songs, proverbs, bewsans, riddles, lullabies (Auli) and so on. There are many Rohingya poets and writers who flourished in the court of Arakan kings. The Arakanese kings had come under the influence of Bengal Sultans. Most of the their courtiers were Bengali speaking people from Bengal and neighbouring Chittagong region and they encouraged the cultivation of Bengali language. The poets and writers who wrote in Bengali and a good number of their poems and works have been discovered. Some of the Rohingya poets and writers who flourished in Araka court are: Abdu Minyo or Ahmedu Minyo, Shah Barid Khan, Daulat Kazi, Mardan and. Shah Alawal. Quraishi Magan, Abdul Karim Khandkar, poet Abdul Karim are also well known writers and poets of Arakan. The British government also used Persian as the official language of Arakan till 1836 A.D.In addition to Rohingyas many Rakhine Maghs also learned Persians. For example- Seikky Thado Pe and U Aung Gyi. Later on Persian was replaced by English and Urdu. Thus written languages of Rohingya, Persian and Bengali almost disappeared from Arakan during the later part of British rule. The British subtitued English, Urdu and Burmese in place of Rohingya, Persian and Bengali. The Rohingya used Urdu till 1945 British re-entry. Urdu language is rich in poetry and literature. The kinds of birds can be differentiated with their feathers. So it is time for Rohingyas to establish their ancestral dress, literature and culture. Rohingyas are rich with fine-arts, music and architecture. Rohingya architecture resemble the Arab Saracenic style which is witnessed by the mosques of Arakan. Sandi Khan mosque was built with hard rocks and easier design which stood as the oldest Rohingya's archeological monument. So, it must be preserved by the Rohingyas. Rohingyas should take pride for those Muslims who had built this mosque.